This type of electronic pollution is not e-waste as you think of today, but electrical noise pollution. Ever-rising ambient noise floor levels have been an issue since the inception of electronics. In excess, it can render both analog and digital circuits useless, or at best annoying to use. Addressed in the article are the phenomenon of unintentional heterodyning and signal to noise ratio degradation, from both natural and man-made sources. Author Garrison touches on the intentional generation of noise for electronic warfare applications. I did a quick Internet search looking for plots of typical background noise levels in an urban environment for today and from the middle of the last century (~ 1950), but with no success. Interestingly, the significant ambient EM energy levels of current times is being captured and reclaimed to power micro power devices, so the news isn't all bad. If not for spread spectrum technologies that can operate reliably at S/N ratios less than one, however, many forms of communications would be next to impossible. "The Electromagnetic spectrum is one of our major natural resources. For decades, we have been taking it for granted. We can no longer afford the luxury of such an attitude; there must be a clean-up in spectrum pollution." Environmentalists who did not fully understand what he meant applauded the 1968 address in which FCC Commissioner Robert E. Lee made his plea. Engineers who did understand him agreed that the EM spectrum deserves to be ranked with air, water, and other resources. Most experts, however, took a dim view of the possibilities of a quick cleanup even in the limited part of the spectrum that includes the r-f band. - En route from Miami to San Francisco, a jetliner's navigational system suddenly indicated that the plane was headed for Mexico Citv. 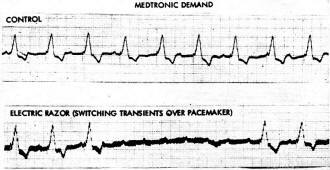 - A banker wearing an implanted cardiac pacemaker nearly died when he stood close to a commercial microwave oven, and a woman using a similar device was thrown into cardiac crisis by diathermy equipment near her hospital room. 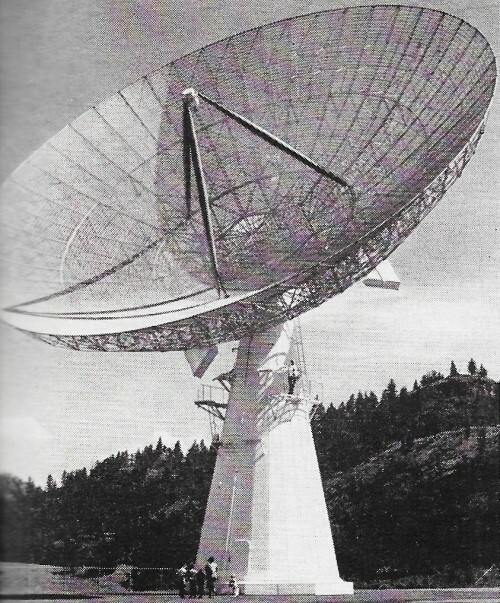 This giant radio telescope had to be moved because of interference problems. - A Colorado businessman (who should have known better) used properly functioning equipment operating on a licensed frequency, to call his office by radio from a construction zone; three members of a work crew narrowly escaped death in the blast and rock slide he triggered. - Radar systems of a major airport went haywire due to uncontrollable disturbances. The trouble began on Christmas Day. "Now we've learned to expect an annual battle with interference from toy walkie-talkies. Thank God those things break after a few weeks," said an FCC engineer. - Memory banks of a big Louisiana computer system were crippled when stored information was suddenly erased by radar from a nearby airport. And so the list goes on and on, pointing up a rapid growth and continued increase in a form of pollution environmentalists often do not even cite. In the U.S. alone, the FCC receives about 1000 complaints per week about interference. Worldwide, the electromagnetic spectrum is becoming unbearably crowded. Simultaneously, proliferation of highly sophisticated electronic devices is multiplying the probability of your receiving unwanted inputs. 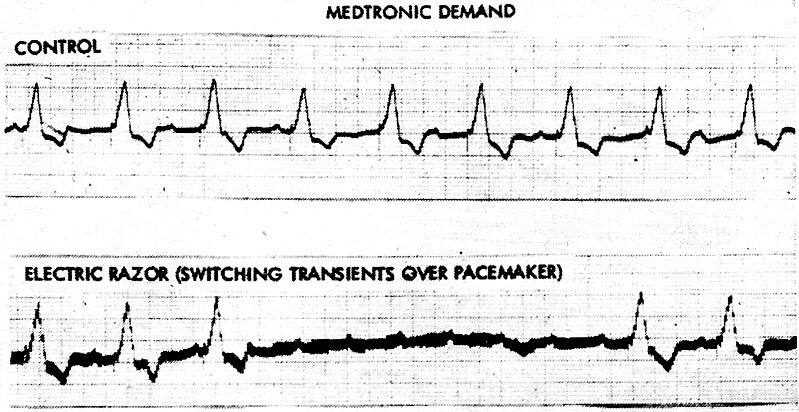 The 1971 international symposium of the Institute of Electrical and Electronics Engineers that was held in Philadelphia zeroed in on this problem. 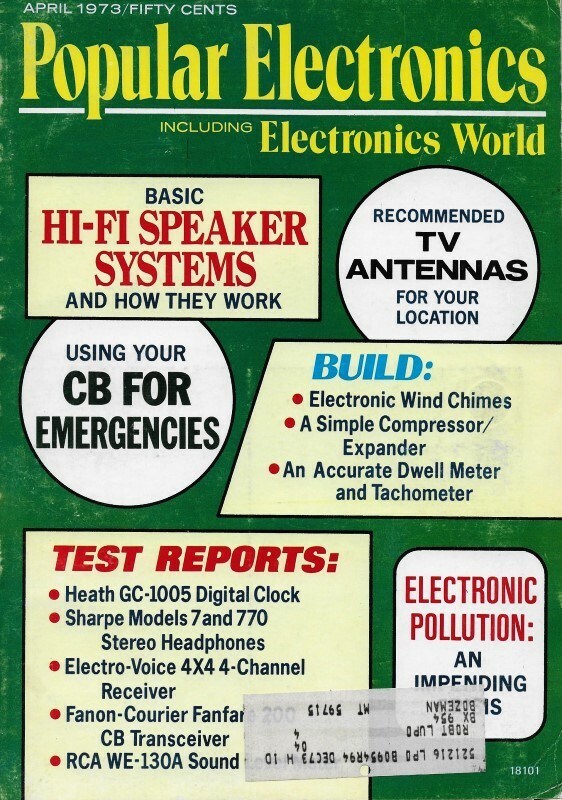 Robert D. Goldblum, a supervising engineer at General Electrics Re-entry and Environmental Systems Division, spoke for 500 scientists and engineers from seven nations when he said: "With thousands of radio, television, and radar transmitters throughout the world beaming electromagnetic radiation through the air almost constantly, we are literally polluting the electromagnetic spectrum." Noise. During the early days of radio and telephone communication, acoustic filters were numerous and troublesome. It was natural to call such disturbances "noise," and to extend the label to cover electric waves that produced them. Today, interfering waveforms that do not have audible output are encountered in many systems. But "noise" remains the most common name for any kind of interference. Much noise in a communication system is internal. Some is thermal. Other effects stem from electrons traveling from a heated cathode toward an anode. Such noise is of vital importance in communication, but pollution of the EM spectrum stems from noise caused by radiation external to the systems affected. Much of it is due to natural processes. But man's additions are constantly growing. International Q signals used to describe r-f interference label nature's noise QRN. At first considered to be rather simple in nature, QRN is now known to be enormously complex. 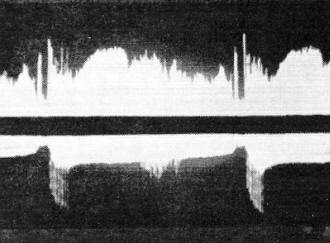 Beyond both ends of the radio band, waves create effects unknown to early radio pioneers. Atmospheric static is believed to be linked with electrical discharges that take place between water droplets during turbulence. It is especially strong in the AM broadcast band but also affects the vhf band used for TV and FM. Current tests indicate that rainstorms produce broadband noise that extends deep into the microwave region. Solar flares sometimes cause widespread disruption of radio service. But many faint signals that reach our planet come from more distant sources. Cosmic rays, X-rays from galactic sources, and infrared light shower down on us from every part of the universe. Radio astronomy was born as a result of studies aimed at reducing noise in telephone conversations sent across the Atlantic by radio. Karl Guthe Jansky of Bell Telephone Laboratories hooked up a 100-ft antenna to study noise. One night in 1932, he picked up a new sound that was somewhat like a faint hissing. Eventually, he identified the source - it came from the stars. Since then, it has been discovered that various types of celestial bodies emit so many different kinds of radiation that most or all of the EM spectrum is affected. Man's Contributions. QRM - man-made electrical noise - is often called "grass" by radar operators. TV engineers complain about "birdies" and "glitch." Along with a bevy of other man-made effects, these constitute electromagnetic junk. Motors were the first devices to yield radiant trash. Today, a multitude of household and industrial appliances, from electric shavers to arc welders, produce radiant energy as side effects of their operation. Medical equipment got into the act at least as early as 1905, a decade after Roentgen discovered X-rays. Abundance of X-ray, diathermy, and other machines causes a modern hospital to literally pulsate with radiant energy. Most of it does no harm, but any day, any burst of radiation can create emergency-level noise if it happens to fall upon a system capable of receiving it. Communication would return to the era of the carrier pigeon if we suddenly stopped using enormous quantities of radiant energy to convey signals. 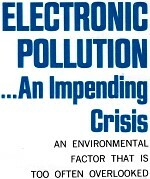 But the proliferation of radio transmitters is a major factor in the production of electronic pollution. In 1949, there were 160,000 transmitters operating in the U.S.; today, there are 36 times as many. No one knows what happens to individuals whose electrical processes are affected by radio and TV transmissions. But Britain's respected journal New Scientist has pointed out that a 1.25-megawatt station dispenses so much radiant energy that the daily bombardment one mile away is sufficient to lift the family car 2 ft off the ground. Irrelevant? Not according to growing evidence. Quotes New Scientist, "There is some connection between chronic exposure to certain radio frequencies and a wide range of physical and mental disorders." About all we know positively is that some human organs are more susceptible to radiation damage than are others. "Practically speaking," points out Robert Goldblum in the 1970 edition of ITEM, "the human body is a three-dimensional mass having width and depth, as well as height. Therefore, when a man stands erect in an r-f field, he represents an object whose height, width, and depth dimensions can be expressed in terms of wavelength. When the body is so oriented that any of these major dimensions is parallel to the plane of polarization of the r-f energy, the effects are likely to be more pronounced than when the body is oriented to other positions." Transportation is more obscure than communication in its role as an EM pollutant, but it is highly important because whenever a spark occurs, a radio signal is generated. Many ignition systems radiate staccato-like bursts of noise over a broad range of the r-f band. Radar, now vital to forms of transportation ranging from measurement of highway speeds to observation of aircraft, emits its own kind of radiant energy at constantly increasing levels. Man's Further Contributions. Lights of various kinds emit enough radiation outside the wavelength of visible light to be considered serious pollutants. Few ordinary sources of electronic noise give TV receivers more trouble than does a flickering fluorescent tube. Neon advertising signs and other signs that use gases can create a virtual EM blackout for hundreds of yards in every direction. Nuclear blasts at high altitudes yield radiant energy that interferes with some radar frequencies. Called the "Argus Effect" because it is reminiscent of the Greek creature with 100 eyes, it is being studied as a possible technique for rendering blind enemy radar. And electronic countermeasure (ECM) devices are constantly being developed, adding to the pollution problem. Microwaves, first put to practical use in World War II radar installations, offer some hope, plus new dangers. Today, microwave relay towers dot the countryside of every advanced nation. With at least 50,000 general-purpose computers operating in the U.S., it is inevitable that microwave transmission of data will show a dramatic increase within this decade. But microwaves are not limited to the field of communication. They do everything from curing plastics and lumber to warming and cooking food. Relatively innocent as sources of noise during the early years of use, microwaves have now been indicted on many counts. TV Detective. More than any other common electronic device, TV receivers reveal pollution. Much of this noise stems from too strong signals. Such interference is a nuisance, but it is not a hazard. However, it points up the complexity of the problem. Practically all common sources of EM radiation produce characteristic and readily identifiable patterns of visual disturbance. Mild r-f interference creates a cross-hatched or basket-weave pattern. Diathermy creates moving ripples, herringbones, and similar effects. Power-line noises that can originate at any or all of five sources in normal cable suspension hardware creates pulses that can stop any show. Spark plug interference, usually random, causes fleeting but conspicuous spots. Boats and motorcycles cause much more trouble than do cars since their plugs are less heavily shielded. 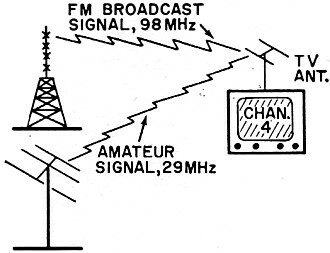 Two signals add or subtract to equal frequency of TV channel (98 - 29 = 69). Transmitters often radiate energy of several different frequencies with receivers that can frequently pick up two or more frequencies. This factor, coupled with the multiplicity of external sources of noise, makes the chart of sources of TVI too complicated for beginners to read. Every time a TV receiver reveals interference, it can be taken for granted that dozens or hundreds of unseen events are occurring simultaneously. Electromagnetic interference is usually intermittent in a given case. But at any instant, it is taking place wherever electronic devices are being used. An Uphill Battle. In the war against electronic pollution, progress is being made. But EM interference sits on the shoulders of the electronic age like the Old Man of the Sea on the back of Sinbad the Sailor. With each forward step, the burden becomes heavier. Upgrading specifications for color-TV receivers has about eliminated excessive X-rays - from properly functioning equipment. Tighter control over manufacturing standards has produced microwave ovens that pose no threat to wearers of cardiac pacemakers-providing that the door seals of the ovens remain factory-fresh. Passengers on jet airliners are no longer permitted to operate FM radio receivers during flight; they can wreak havoc on navigational equipment. Radio-controlled model airplanes have been outlawed in many cities for obvious and not-so-obvious reasons; one manufacturer, Champion, has spent a fortune developing a resistor spark plug that minimizes noise. Too, the FCC is making a real effort to crack down on broadcasters who do not adhere to assigned frequencies. Meanwhile, the tide of pollution mounts. Gains are more often than not offset by the continuing upsurge in the number and kinds of equipment transmitting or receiving r-f and microwaves. Deliberate jamming is a growing international problem, as is radio and TV piracy. Most domestic interference is unintentional, but it may occur whenever the right conditions are found. Every increase in radiated EM energy has potential for creating new problems. Largely unexplored biological effects of EM radiation are so vast that in some circles there is serious talk of trying to lead-shield homes and offices close to powerful transmitters. With the microwave communications industry already billed as the "next big glamor field on the investment horizon," there is little doubt that radiation will increase faster than protective measures can be taken and applied. Interference now pollutes the spectrum so badly that the man on the street faces an impending global crisis. There is no real hope that interference can be eliminated. The best we can do is try to keep it at tolerable levels.